Republican presidential candidate Newt Gingrich is defending the “strategic advice” about home ownership he was paid to give agencies in the federal government that are now lightning rods for criticism. According to a Bloomberg News report, Gingrich was paid $1.6 million by “Freddie Mac” over an eight year period. Other Republican candidates have been touting their outsider status. Texas Governor Rick Perry said yesterday in Iowa that Washington is broken and someone who’s been “an establishment figure” can’t fix it. Gingrich, in contrast, routinely touts his accomplishments as House speaker in the 1990s. 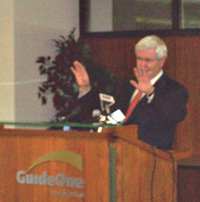 Gingrich was a member of congress for two decades and served as speaker of the House from 1995 to 1999.